Today we are announcing version 1.6 of the App. The new release is available right now on the App Store, Google Play and Web App (currently in Beta, available on request). After Software and Hardware, we are now releasing the Public Agents. These agents are available to use by all customers. The are similar to Software agents except that customers don’t have to manage the Virtual Machine hosting the agent. As for the pricing, they count as one agent in the plan so they cost the same thing as other agents. Today, we have 16 Public Agents available with 3 Public Cloud Providers (AWS, Google Cloud and Microsoft Azure). On the 16, we have 6 agents Up (meaning they can be used right now by customers) and 11 are available within 24h after a first customer request. 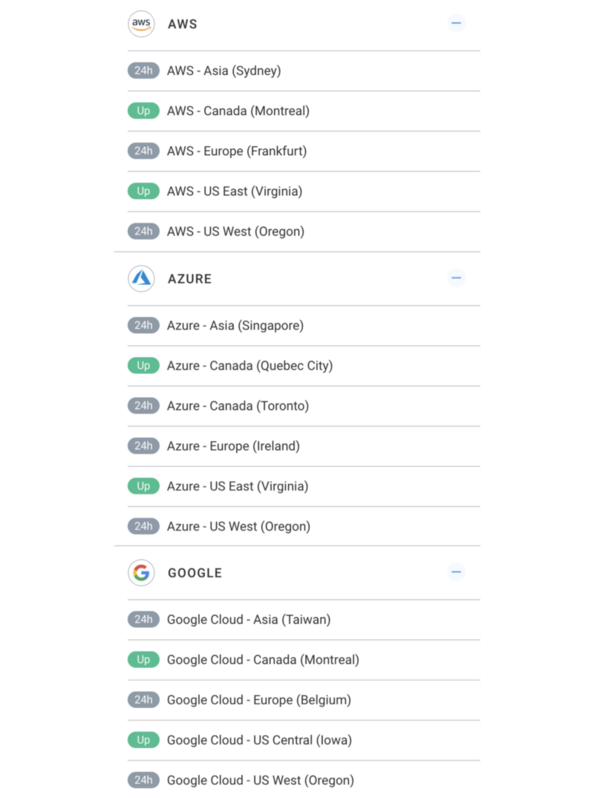 This list will grow over time as we add Cloud Providers and new regions. If you have a Cloud Provider or a specific region you would like to see, contact us at support@obkio.com. It is now possible to chat with our Support team directly from the App. Click on Menu then Support and use the chat icon at the bottom right. If the team is unavailable or response while you are away from the App, no worries, the conversation will automatically continue by email. We are introducing a beta version of the manual speed tests between agents. You can access the feature by clicking on Menu than Speed Tests. This is the first release with that feature, please give us feedback by using the Support Chat or support@obkio.com. Note that agents must be able to communicate together to run speed tests. The connectivity rules are exactly the same as for the monitoring sessions. More details at http://help.obkio.com/troubleshooting/dealing-with-agents-cant-reach-each-other.